closed... dem wouldn't get caught, rudeboy. 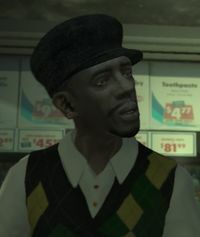 Teafore Maxwell-Davies, known as Real Badman is a character in the HD Universe and a 30-year old Jamaican cannabis dealer in Grand Theft Auto IV, an associate of Little Jacob and the head of the Hillside Posse gang in Broker. He speaks in very thick Jamaican Patois, which Niko Bellic has difficulty understanding; Jacob translates for Badman in his somewhat more comprehensible Iyaric. Badman is first introduced to Niko in the mission Shadow. After knocking on Jacob's door, Badman grabs him and holds a knife to his throat until Jacob confirms that Niko is his friend. After that, Badman complains about another dealer moving in on his turf. He asks Niko to get rid of these dealers for him so he can continue business as usual. After performing this task, Niko briefly works as a drug runner for the Hillside Posse, Jacob directing the deliveries via cell phone; this job includes conducting drug deals (broken up by police stings which result in extended chases), planting packages in secluded locations (interrupted by rival gangs who attempt to kill Niko and take the loot) and small exchanges in which Niko must take the drugs to the buyer before a tight deadline. After several jobs, Badman decides to stop giving Niko work due to heavy police investigation. As a sign of gratitude for the jobs, Jacob leaves the custom Huntley Sport driven by the Hillside Posse outside the cafe instead of one of the "beater" cars usually left there. Later, When Niko is strolling through northern Dukes(just off Dukes Boulevard), he is stopped by Badman who is sitting on a bench in front of a row of shops. Niko fails to recognize him at first, but they manage a conversation despite the language gap, and Niko discovers Badman's business is being threatened by a Russian gang; together, they wipe out the Russians, and Niko is given $500 for his troubles. Badman attends Roman & Mallorie's wedding alongside Jacob; after the wedding, however, Badman is never seen again, although he can be mentioned by Little Jacob when taken out by Niko. Jacob states that Badman has changed by selling cocaine and is getting very greedy with the money he has earned and is also getting involed with the mafia. First Name: Teafore "Real Badman"
Affiliations: Linked to West Indian criminal gangs in East Liberty City. Believed to be head of Marijuana and Cocaine distribution network based in East Liberty City. Close ties to Jacob Hughes, street name - Little Jacob. Suspect in several high profile armed robberies and hijackings. On Lifeinvader in Grand Theft Auto V, Franklin Clinton's cousin Tavell Clinton claims that he's moved to Schottler, and is living with two Jamaicans and a student from Senegal, stating that they're four black men who can't understand eachother. Tavell may be living with Little Jacob and Real Badman at their apartment on Dillon Street. Early GTA IV game art of Real Badman wearing a hoodie instead of a white blouse and Jamaican colored argyle vest. Real Badman sitting on a bench before his random encounter. Real Badman's random encounter in GTA IV. This page was last modified on 10 May 2014, at 13:14.